Last night, two friends were in town working for a band called FOUNTAINS OF WAYNE.. You know that song "STACY'S MOM"? Well, they sing that song and are a pretty horrible band, but they were opening for the band SQUEEZE whom I love and got hooked up with back stage tickets, so I went.. 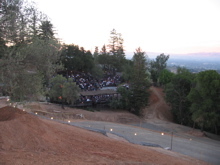 The show was held at this beautiful venue called the PAUL MASON WINERY up in the hills of ritzy Saratoga, Ca.. Only 9 miles from my house, but still a twenty minute drive. $10 for parking? DOH!! I would have parked on the street if it wasn't .5 miles away straight up hill. But it's a tax write off for me, so I splurged. And for some reason I was in a giving mood. I gave him my extra back stage pass ticket and man oh man... the guy was freaking out. He was ...ummm. older than me? Hard to tell since I'm pretty old, but I look so good. Anyways, I should have sold him the ticket. I could of turned a profit from this. Oh well. He said "MAN...THANKS... I have a joint, do you want to smoke?" I said, no thanks. And then he offered me a beer. Well, I don't really drink, but shoootzz... WHY NOT? $8 a beer, I'll take one. Off to our VIP seats next to the stage. FOUNTAINS OF WAYNE were still playing. I saw my friend TITO doing sound and winked at him. My other pal Neil was the drum tech. and he just stood there on stage looking silly. It's cool. He's getting paid $800 a week to look silly. Nice job. The friggin crowd was super old. It was like dang... This band used to be so hip and now it's all old people. Oh well, father time ya know. Tito took me back stage and we chatted a bit.. They played LA the previous night and met Harry Shearer who does the voice of Principal Skinner from the SIMPSONS. He's also the genius of many a great movies like SPINAL TAP, A MIGHTY WIND, etc. etc.. There was some dude who was worth 9 billion dollars back stage. Some guy who invented the wireless system for blackberry's or something. I just thought "GEEEZ... that's a lot of money" wonder if he'll give me some for PLEA FOR PEACE? Anyways, the show marched on. SQUEEZE rocked out all the hits "UP THE JUNCTION, PULLING MUSCLES, TEMPTED, COOL FOR CATS, on and on and on. It was good. ME LIKEY! But I headed off a bit early to bit the stadiumesque parking debacle that those bottleneck type of dealios create. Make sense? But yeah, me learn lesson. Sell ticket next time.